For getting fast and reliable locksmith services, hire our company. We have the top experts in Texas on our team and offer a full range of solutions for households, businesses and car drivers from lock repair and key replacement to emergency lockout opening. 24/7 locksmith services / Lockout assistance, lock repair and rekeying & key replacement! For fixing a stuck lock or for replacing broken keys, choose the professional services of our dedicated company, "Locksmith The Woodlands". We specialize in the commercial, residential and automotive fields of our industry. Whether there is an issue with the door lockset or key of a house, office or car, we will resolve it completely in the shortest time. Our service range is fully comprehensive and includes repair, replacement, rekey and installation of locks plus repair and replacement of keys. We provide solutions on an emergency and schedule basis. Factor like lockset brand, age and design are irrelevant to us. Our experts can handle even the most complex and advanced devices used in homes, offices and vehicles. We are committed to providing perfect servicing in any situation. Do not hesitate to reach us in case of a car, office or house lockout. Our technicians will be with you shortly and let you back inside in minutes. Our emergency service is fully reliable in every respect. We respond to distress calls swiftly and send fully prepared professionals to the provided address. Our specialists in Texas are fully equipped to perform any task from broken key extraction to rekeying on the spot. Even the most complex of issues are resolved right there and then. Our lock repair, rekey and replacement services are based on accuracy and close attention to every detail. By inspecting the condition of the device and running tests for operation, we identify the problem and its cause precisely. Then we implement the best possible solution in the given situation. We use only the finest precision techniques and the most technologically advanced equipment in our industry to do the perfect job in the shortest time. When it comes to spare parts and materials, you can be certain that we use only the best ones. They are carefully chosen by our locksmith company in The Woodlands for ensuring that they are perfectly strong, durable and reliable. All of our work is focused on achieving optimal door security. That is why we service not only locks and keys, but commercial door closers as well. From rust removal and lubrication to repair and replacement, we do everything necessary ensure the perfect functioning of these devices. Another one of our narrower specialist areas is the servicing of file cabinet locks. If you run a business, you should never underestimate the importance of these devices for the security and operation of the company. We will do everything necessary to ensure that they work perfectly at all times. * Lockset installation - The device is fitted into place and secured firmly. We fit every component with maximum precision to allow for super smooth operation. * Strike plate setup - Our technicians use only the strongest and thickest screws that will hold the plate firmly in place and reduce the risk of forceful door unlocking. The plate is perfectly aligned to the latch and bolt of the lockset. * Testing and fine tuning - We check how the lockset works and make adjustment to the settings, if needed. For smoother operation, we can add dry graphite powder lubricant. 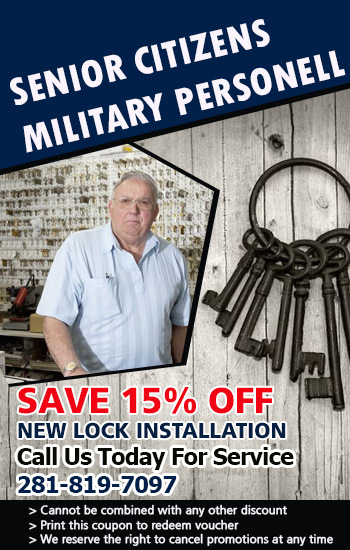 Tell us what issue you are facing or what ideas for security improvement you have in mind and we will arrange the best local locksmith specialists to do the job for you. We will ensure that you receive the perfect service in every respect. Our expert technicians in Texas fix and replace locks and keys of all types professionally and quickly. We have the best solutions in the residential, commercial and auto locksmith fields. Everyone in the area with zip code 77381 can take advantage of them.